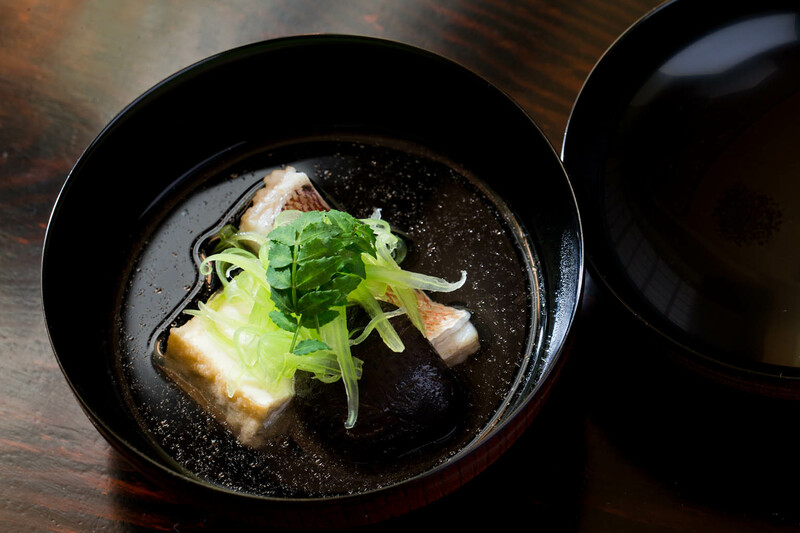 Exquisitely plated two star Michelin Kyoto cuisine created by an Okinawan chef, paired with an unparalleled sake selection – the intimate Matayoshi fills both your heart and your belly. It is the synergy of elements in the Matayoshi dining experience that make it simply wonderful. 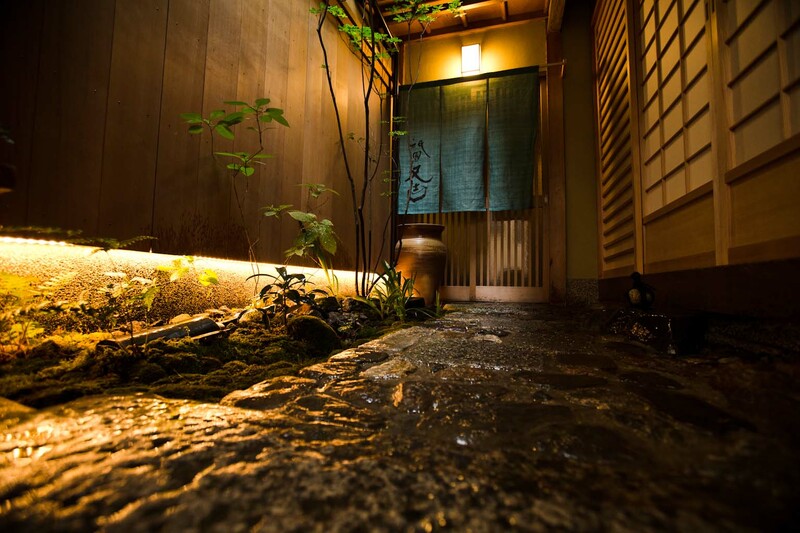 Matayoshi offers a quiet retreat from the busy Gion streets, found in one corner of a neighbourhood filled with historic and well-known fine dining establishments. Typical of a traditional Kyoto residence, the olive-colored stucco walls and wooden slat sliding doors and window covers give no hint of the presence of a restaurant. But then as you proceed, along the cooling wet stone path and past the fresh green garden, you can see the characters ‘Gion Matayoshi’. Hanging across the doors and made from finest quality kimono fabric, the noren is adorned with calligraphy by an artist who has been designated a Japanese Living National Treasure. The stylish interior is like a master class in Japanese aesthetics, with its perfected minimalist simplicity. With no expense spared, all traces of modern accoutrements are hidden. An artisan visits to weave the delicate fibers of the ceiling decoration, and the chairs are all hand-made by Tokunaga Furniture, which prides itself on achieving incredibly smooth texture with woodworking tools alone, to preserve the natural grain of the wood. Making creative use of indirect light, the beautiful rays cleverly separate the kitchen space from the main seating – a solid hinoki wood counter for eight. While the display of knives behind the chef is rather imposing, the intimate seating is conducive to conversation with the warm chef, making your evening truly memorable. 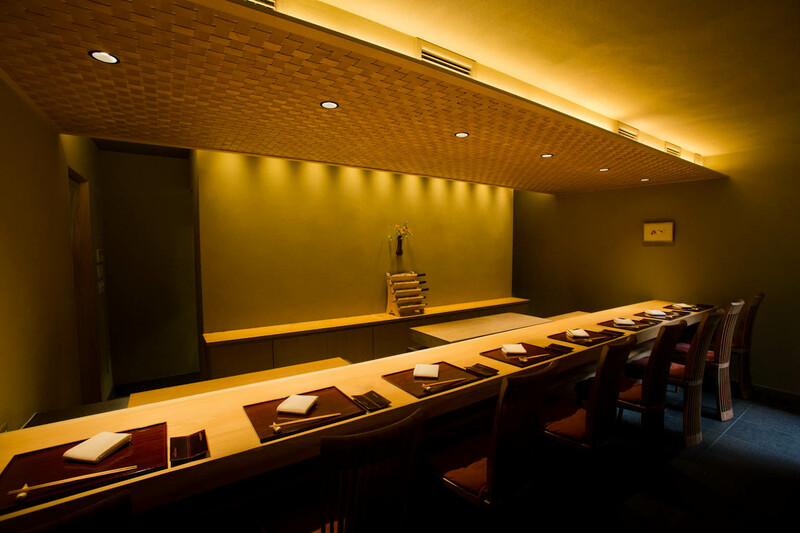 Matayoshi is Kyoto cuisine based on tea ceremony kaiseki, but with a modern flair. 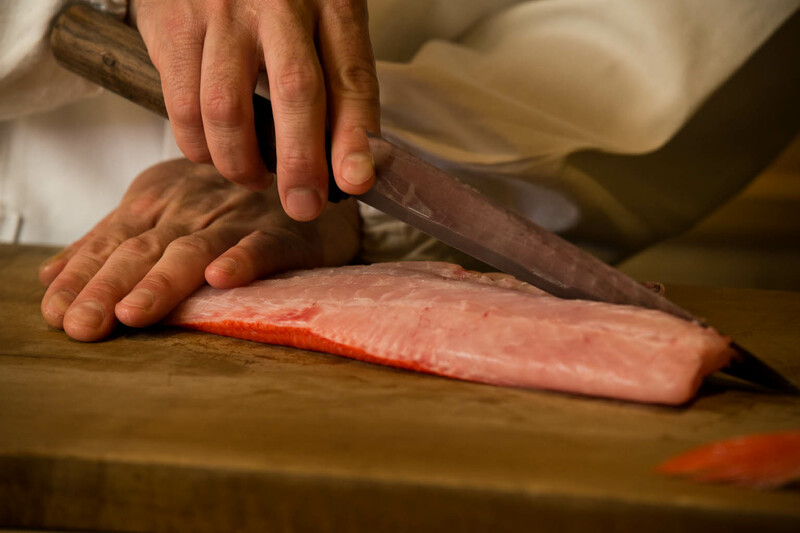 Chef Matayoshi emphasizes the best of flavor and texture in each of the carefully selected ingredients he presents, adding inspiration from all kinds of cuisines. The always stunning and sometimes dramatic plating brings nature inside with bamboo grass sprouting out from beneath or the appearance of a leaf floating down a bubbling brook. Chef Matayoshi finds creative ways to introduce new ideas that excite him, and he especially loves adding playful touches from his home of Okinawa. 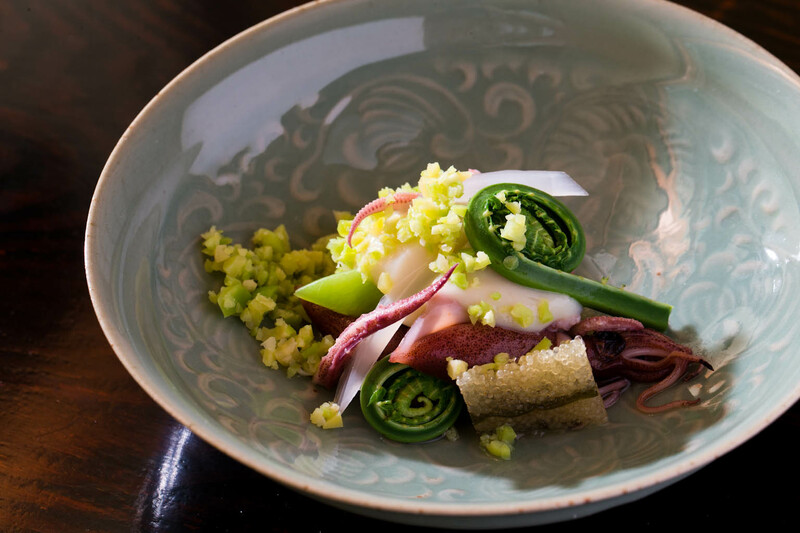 An early summer visit may begin with the pinks and greens of spear squid with roe and firefly squid, topped with brilliant verdant fiddleheads. 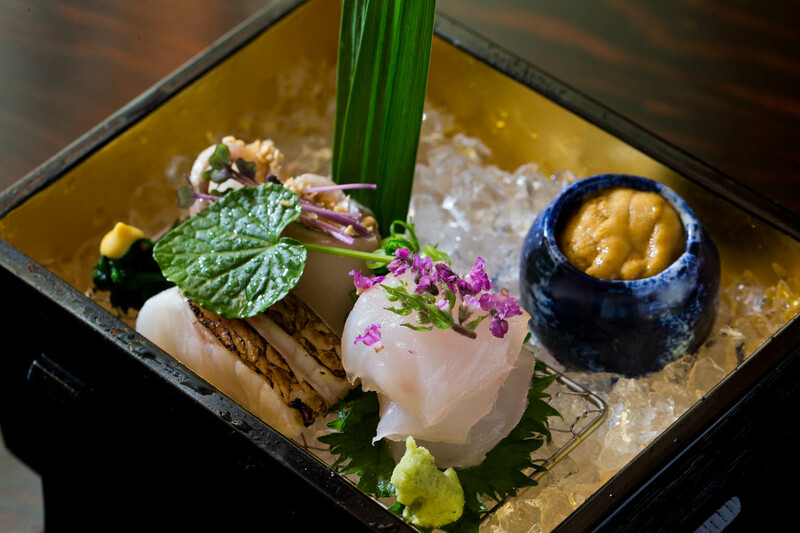 A heartwarming bowl of tilefish from the Wakasa area of Fukui Prefecture topped with a dainty stem of sansho leaf buds, is followed by a succulent selection of sashimi including tilefish, black-throated seaperch, Okhotsk atka mackerel (hokke), and sea urchin. 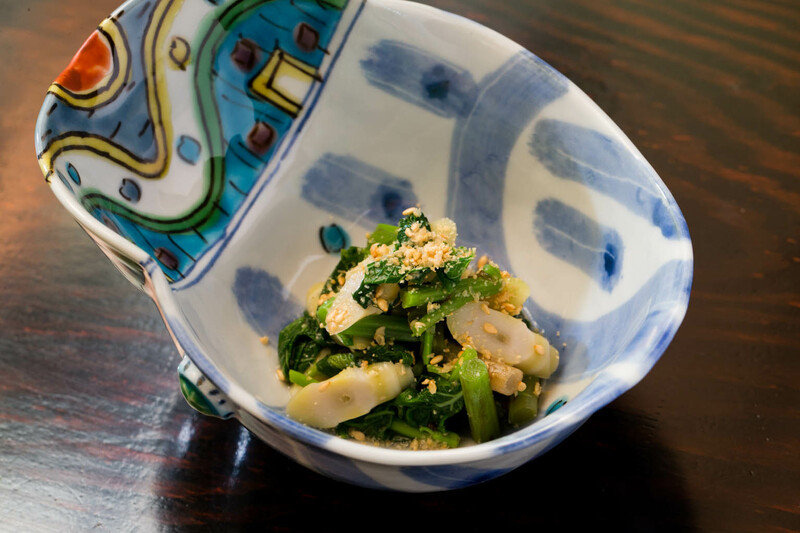 A deliciously crunchy combination of mountain vegetables in a sesame dressing carries you on the journey through flavors, textures, and temperatures, all the while perfectly complemented by an extensive selection of sake and wine to please any palate. 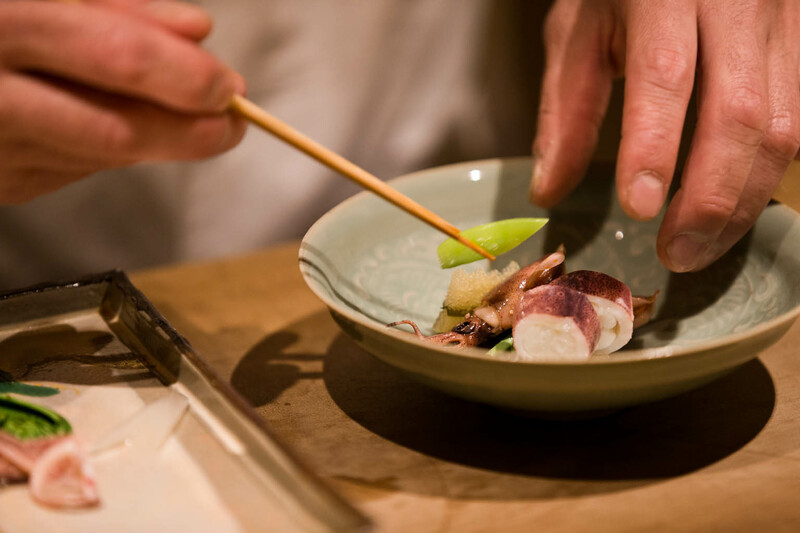 Chef Matayoshi travels around Japan in his meticulous search for ingredients. Believing deeply in the concept of ichigo ichie, a Japanese saying that implores us to treasure every encounter, Matayoshi focuses on giving his guests the best possible ingredients in that moment. He calls on Shiga, Fukuoka and Nara for organic vegetables, and ventures to the cold waters of Aomori and Hokkaido for the freshest seafood. Every drop of every seasoning used – mirin, soy sauce, and vinegar, among others – is also sourced only after paying personal visits to the brewers. Chef Matayoshi’s path from Okinawa to two star-Michelin caliber Kyoto cuisine has been rather unorthodox. A constant troublemaker as a teenager, he flitted from job to job during high school. He loved scuba diving and dreamed of one day being a professional diver. But suddenly one day, a spark in his mind told him he would make an excellent chef. A television special featuring the head chef from Maruyama in Gion spurred him to the ancient capital to knock on Maruyama’s door. But he was promptly turned away and found himself jobless in Kyoto. An opportunity arose at Sumiya Ryokan, the more than 100-year-old traditional inn in the heart of Kyoto, and this is where Matayoshi acquired his culinary skills, over a period of four years. He left for new experiences, but was called back to take on the role of head chef at just 33 years old. And then at the age of 36, he left to establish his own restaurant in a dark narrow laneway with few passersby. Business was not promising at all, but an appearance in a popular women’s magazine gave Matayoshi the boost he needed. A steady flow of customers turned into a flourishing restaurant, and after eight years, his aspirations to move to his beloved Gion became a reality. Always filled with ideas for improvement and expansion in his existing restaurant, Matayoshi currently wishes for a bigger work space. Beyond that, his dreams revolve around finding new places to express his cuisine, like a restaurant on his home island of Okinawa, and the equally exciting prospect of somewhere overseas. 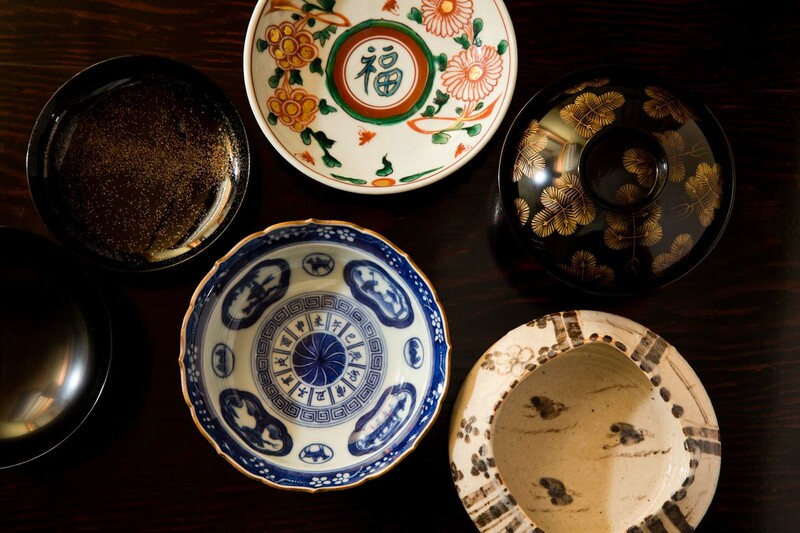 Matayoshi’s tableware collection spans the whole range of antique and modern pieces. The tableware is carefully chosen one by one to express seasonality and complement the innovative presentation Matayoshi employs. 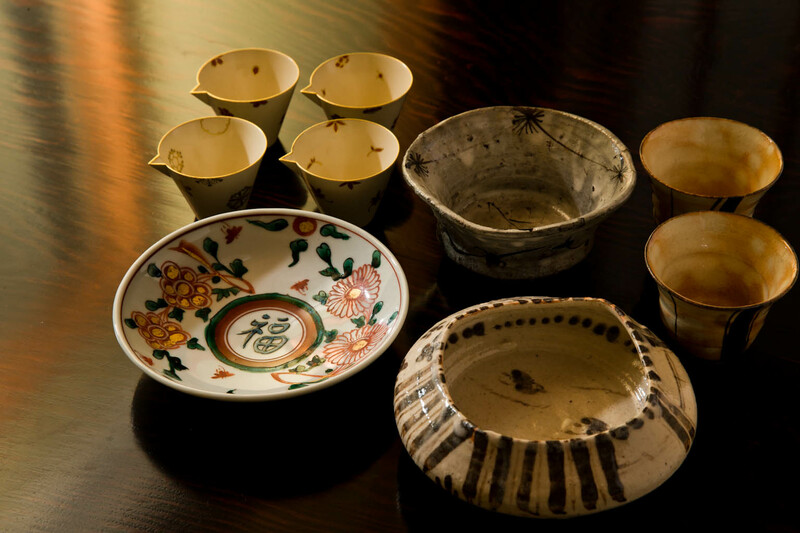 Antique items include Bacarat crystal ware, and ceramic pieces by Eiraku, Myozen (the widow of the 14th generation Eiraku master potter), as well as Sawamura Tosai, an antiques dealer turned artist whose studio has created tea ceremony utensils and ceramics since 1910. But Matayoshi is especially proud of the works of young, up-and-coming artists that he possesses. He is deeply aware that purchases of older pieces do not contribute to anyone’s growth, whereas supporting younger artists provides them with capital to help realize their potential. This idea reflects Matayoshi’s strong sense of responsibility for nurturing others.